I like mixing the bath crystals with the herbs. I Love them both the same. But, it sure is easier to use the bath crystals. I don't know the exact recipe for Van van herbs but here is a list of herbs that may help you. Just look to see if Van Van oil is listed and then it will have the associated herbs listed. what do you think is more appropriate to use next day after BlockBuster ritual? The lemon grass and the pine needles. Can anyone tell me where I can find in this forum about D.U.M.E. bath crystals? Is it ok to take a second, different bath directly after the first, i.e on the same day? My lovely Lucky Mojo order just arrived. I ordered an Attraction spellkit which I am wanting to start tomorrow, so that it would complete on the day of the full moon, which I believe is the 27th. However, I was hoping to perform a Blockbuster or Road Opener (or both) bath prior to starting the kit. As they have all only just arrived, I was wondering if it would be advisible to take the Blockbuster bath early tomorrow morning, then immediately take the Attraction bath, then dry off and dispose of both. Or would the second bath negate the first, as I would be removing the herbs and influence of the first with the second? Consider taking the Blockbuster bath one day and then waiting until the next to take the Attraction bath. It isn't so much a question of ''negating'' work but rather giving each bath/herbs/work the time to sink in and build a bit of momentum. The time to let yourself reflect and assess how the work is affecting you and if more is needed before moving forward to the next step, rather than catapulting through the work at full speed just to get it all done. Doing quickly doesn't = results faster. That said, others here with more experience will no doubt have excellent advice to give you as well. How do I use sea salt baths to cleanse myself and how often do I do it? Is it just for the duration of the spellwork or is it before and after the work is done? What are some other cleansing methods? Here is a whole page that Miss Cat wrote on the uses of salt, including baths. You should find your answers here. Hello to all. I plan on starting my cleansing in December I already have my salts, soap herbs etc from lucky mojo shop and I will be ordering some candles ASAP. I have to start this new year the right way. For the drawing this will be 7 days starting Thursday waxing moon hands up on the clock in the afternoon. After each bath I will take a bit of the water and keep it until I am finish then water a plant with it in our front yard. I will only use a little liquid(I don't want to kill the plant) over left shoulder towards east walk away don't look back and don't go in the same direction I came. The reason I am watering the plant with it is that I want my money and luck to increase to grow get taller bigger flourish. Think of it bearing fruits, seeds flowers. Yes the cleaning sounds good. You can have MISC set an uncrossing and road opener candle for you at the same time. Thowing it east at the sea is fine, though everyone leaves by some cross road, though it may not be quiet. Drawing bath you can pour on your steps to draw it to your door or in the back yard to draw it. Depending what it's for you can start at a bank and lead to your home to draw money, or a lovers house to yours to draw their love.etc. Hi, so if I'm doing money drawing to win money (gambling) can I take my collected bath water put it in a bucket and go to the number house start pouring some of the liquid there get back in my car and as I drive pour some out until I reach my home or front door and if anything is left toss it over my left shoulder towards the east in my front yard? I took my first bath but I don't feel positive. I feel depressed, angry and negative. Should I make this a 7 day bath instead of 3? Am I doing something wrong? We are not going to try to function as a psychic advice line here, but in my experience, bathing is so natural and positive for most human beings, that if taking an Uncrossing bath makes you feel "depressed, angry, and negative," it is very unlikely that you are "doing something wrong" or that the bath product itself is defective. Rather, you may be under some form of spell of negativity, you may have social or mental issues too difficult for a mere bath to change, or there may be other things going on in your life that are keeping you from feeling affirmative, hopeful, or at-cause in your life. I would continue with the 3 baths, as you planned, but perhaps a reading would be of help to you as well. Okay, hi there. How are you guys doing today? I'm very new to hoodoo magic, it's my first time using any of these products. My mother doesn't allow candles in our house because of fear of our house being burned down...our apartment was burned down by a single candle before I was born. Anyways, I have an interview at a private school next week, I'm super excited. My question is, would getting the lucky bath crystals in my laundry, make a difference in my interview. What should I do? Thank you. I'm doing a love spell, and it says to take a ritual bath before dawn. Can I air dry for the most part and then use a hair dryer on my hair later on? Also, am I supposed to dispose of the water at the crossroads immediately after bathing? Thanks! Use the combination of Steady Work/Attraction/Crown of Success sachet powders to gently dust the keyboard you will be using when sending your resume online, and the oils to LIGHTLY anoint the corners of the computer that you will be using. You can also do a petition paper in your shoe. The answer is yes to both of your questions! The answer is: "YES". Absolutely! I've just realized something. I've been regularly spraying the bedroom that I share with my ex with Love me + Stay with me bath water mixed with a little menstrual blood. However, I've always dissolved the bath crystals in room temperature bottled spring water since it's for spraying and not for taking a bath. Now I wonder if cold water could release the essence of the herbs in the bath crystals at all. Should I have used hot water instead? I hope I hadn't been wasting products all this time! Hi. I'm doing a three day love uncrossing bath ritual. It's a waning moon so that's good. I did my bath at sundown as I've read that's a viable option to sunrise. My thinking is that I wish the sun to set on any crossing I've sustained. It's also new years day, so the first bath is today. I thought that would be powerful. Likewise, I threw the used bathwater over my shoulder to the east and did not look back. That way the sun will rise on and shine away the old crossed condition i.e. the used bathwater. Do you think the sundown bath is as effective as sunrise in this case? Also, I accidentally threw the water over my RIGHT shoulder instead of the left. Will this screw everything up? I don't have anymore from this first bath for a redo. With the next two baths, I won't make the same mistake. Thank you for any guidance you can provide. I don't know what to tell you about what was already done. I certainly would do EXACTLY as Miss cat prescribes (as you yourself have said) in the future. Hi. I'm sorry but I don't know who miss Cat is and she didn't prescribe anything to me in this case. I'm wondering if what I did ruined the ritual; I threw the water over my right shoulder instead of the left. Also, is it still effective to do a sundown bath rather than a sunrise bath? These are general ritual bathing questions. Miss cat (catherine yronwode) is the co-owner of Lucky Mojo and her husband, Nagasiva, is the other co-owner. Miss cat is the founder of Lucky Mojo, one of the BIGGEST witches and Hoodoo Practitioners in the world, and, in my opinion, the world's foremost authority. Basically, my situation is this: my boyfriend told me four nights ago - really sort of out of the blue - that we needed to take a break. He's struggled with depression for years, and over the last two months, his depression has become increasingly worse and he's hit a point where he now feels like he needs to be on his own to "solve this". We are still in communication and he's made it very clear that his feelings for me are still very strong and he really does love me - he feels like he's sparing me from pain by taking a break. Coming from a family where depression is very common, I do recognize so many of the symptoms in him - the isolation, withdrawing, the constant sleeping, etc. I fully understand that spiritual help isn't going to be enough and that he needs to get to a doctor and to start speaking to a therapist. He has said that he will at least start seeing a therapist - I will continue to push him to do so and will push him towards seeing a doctor as well, as I think he needs to at least explore the possibility of taking medication as well. I've been pretty upset over the last few days. I don't feel like taking a break is helpful in this situation, because I think it's the depression talking and not my boyfriend talking. I understand that a depressed mind isn't always a rational one, and I'm trying to keep myself strong when I'm around him. I've basically let myself be as upset and scared as I wanted to be in private and now I feel like I need to, for lack of a better way of phrasing it, get a grip because being so upset isn't helping either of us or the situation. I've been reading a lot about St. Dymphna for the last day or so and I feel the need to work with her to help my boyfriend. I'm planning on purchasing her oil and some candles to begin petitioning her on his behalf. I'll also be making a donation in her name to express my gratitude to her. Before I begin working with her, should I take a cleansing bath? I feel like I've had so much internal negative emotional energy over the last few days. I've been so upset and scared and I don't want to start working with her when I feel like I have this lingering sadness. I do believe that this break will just be temporary, so I'm not really concerned with any type of reconciliation work at this time. I'm more concerned with doing work to help him with his depression. I know that we can't get back on track until there's a breakthrough with his depression. Is it necessary to take a cleansing bath before petitioning St Dymphna? If so, what/how should I go about doing so (i.e., what herbs should be used, what psalms, etc.)? I'm sorry to hear you and your boyfriend are going through these difficulties. Depression is horrible and insidious, but can be treated with therapy and medication (if necessary). It is not necessary to take a cleansing bath before working with St Dymphna but if, as you describe, you are beset by negative emotions, a cleansing bath will help you personally. I would use 13 Herb bath for this, as it will clear away any spiritual debris that is affecting you. I'm glad your boyfriend is open to finding a therapist to help him address his depression. You can petition Dr Jose Gregorio Hernandez as well, as he is helpful in finding the right medical practitioner who can help your boyfriend. You can also work Healing products on him as he addresses his depression professionally. It can help soothe him, and the smell itself is tremendously calming and lovely. It is one of my personal favorites. I wish you both the very best, and I hope your boyfriend starts to feel better very soon. 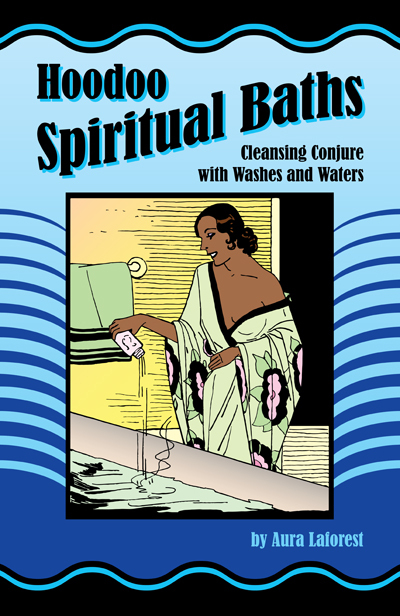 I have a couple of questions regarding taking a spiritual bath. I'm going to be doing a 13 Herb one soon to remove negativity as I feel things have gone a bit stale. Is it ok to listen to music of your choice whilst taking the bath, or should your concentration be on praying and washing yourself clean? Spirits love certain type of music. Happy music. So, you could play it very very softly. But, not loud enough to draw your attention away from your concentrations and prayers. And, sorry, there are no "loopholes" for deployment. I hope I'm posting this in the right place! I was wondering if there is anything you can substitute for a bath or shower? I have trouble taking baths and showers because of disability (I normally have someone help me with sponge baths and washing my hair). I need to do some protection and cleansing for negative work. I tried using a sponge bath for this once and it didn't work at all. Is there any alternative to bathing/showering? Would it matter what the purpose of the bath and the work was? Can you explain why the sponge bath did not go well? I have heard of folks bathing like this before and it worked well for them so if I can get an idea of what was not working maybe we can alter what you are doing in order to make it work. An alternative could be for you to anoint yourself with oils for whatever condition you are needing. I just had a run of very bad luck afterwards, like I used to have previously when I did negative work without protection and purification (I hadn't yet learned from this forum that I needed to do that). Once I followed the instructions for doing these baths, I was able to do negative work without any problem. But when I did the sponge bath, I again had a slew of bad things happening to me right afterwards. This happened twice. I sponged myself with a protection bath mix from feet-to-head, and also put on Fiery Wall protection oil. Afterwards I sponged off with Hyssop and applied hyssop or uncrossing oil. Go to the store and get a spray bottle. Dissolve your mixture with warm water and spray yourself accordingly. If you're doing cleansing, you would pray and spray yourself 13 times (I like praying a verse or 2 of a psalm and then spraying once. Then pray another verse, and spray again. And so on and so on). i looked around but i could not find the specifics on bathing with court case bath crystals. i am going to court to fight an unlawful eviction, would i read psalms 7, 35, or 37? or a combination? i'm leaning towards 35. lastly, which direction would i wash, and toss the water to at the crossroads? this situation doesn't seem like a drawing, but it's not quite a banishment either. In my opinion, it's a drawing because you are drawing justice toward you. thanks for your reply. great insight - "drawing justice toward you" is brilliant. Thanks Nate and Miss Aida for your replies and ideas. I was wondering, will this work with the Uncrossing spell kit that bath crystals? Would I just put the bath crystals in the spray bottle and use the spray procedure you described rather than the bath? Will that be as effective as doing the bath part of the kit? Thanks again! I had a a couple questions about a bath I want to perform. I want to combine a 13 herb bath with uncrossing crystals and oils and do a 3 day ritual. 1) I wanted to know if i could add road opener supplies to this mix. I figured since i always rub downwards with road opener oil to remove obstacles then it wouldn't be a problem to mix it with uncrossing baths since uncrossing baths have to be rubbed downwards. 2) Since i am doing the bath for 3 days i wanted to know if i should collect a little bit of water at the end of each bath and dispose all of it on the third day or should i be disposing the water from each bath separately? Do Road Opener separately. You are mixing different goals here, so do Uncrossing and Road Opener separately. Dispose of the water each day. Is it ok to prepare the herb bath itself in spring water and then dilute it in tap water or should i dilute the prepared bath in spring water as well? I prefer using just spring water myself but this is ultimately up to you. I have heard of people doing both ways. i am wanting to do miscarriage spell what cleansing should i do that goes with this please? Doing a spell to cause a miscarriage is very heavy work, so you'll want to bathe in a tea made with hyssop to take off that sin, and pray Psalm 51 as you do so. I would just like to express gratitude for this particular thread. I am thankful to Miss Michaele for her suggestions, as I have had clients who were reluctant to try the bath salts because of sensitive skin. Again, thank you, all of you, for the many comments and suggestions. I am admittedly overwhelmed by the amount of information, but I am thrilled to have so much to peruse. Get one of the old fashion washtubs that were used before automatic washing machines. They hold quite a lot of water and should fit in most shower stalls. Then the prescribed pourings, 7, 9, 13, etc would be easily done and plenty left over for other uses as well. Any farmer's supply store should have one. Hi everyone! Im new to LM and this forum! Im about to order a spell kit and noticed that bath crystals are included there. However i donot have a bath tub at home and wonder if there is any alternatives to it?? Such as foot soaks? Go to the very first page of this thread and the answers are right on page 1 !! So I got a reading yesterday and clarified a whole lot of what's going on. I took a salt and vinegar cleanse bath until I get my 13 herb bath and I found myself so drained and tired now. I'm out of energy. What could that be? Btw, Someone is using dark magic against me. You could feel drained because you're removing energies that were attached to you. I moved your post to this thread, as it's more on topic with what you're asking. Please try to post under the thread that's most relevant to your question. Dissolving Lucky Mojo bath crystals in warm water and pouring them over one's head in the shower is a common way that people spiritually bathe if they don't have a bathtub (plus, even people who *do* have bathtubs often use bath crystals this way as most spiritually baths aren't the kind you sit and soak in), so yes, that would be a fine way for you to use them. Is it okay to soak some cotton wool in bath crystals ,wait for it to dry and place it in a doll baby ? I'm sorry if this sounds stupid , but I want to purchase some bath crystals to use in my jar spells and lay tricks , just wondered if I could use it on cotton wool to put in a doll. You can also put it in a spray bottle and spray it.